Proforme Electric Barrier automation kits. For beams up to 4m long, low voltage, ideal for small private areas. Wall fixing option, integrated flashing light. 24v up to 4m beams. 240v up to 7m beams. For private, public and industrial car parks. Electromechanical barrier gate operator with encoder. 240V up to 250 NM Torque. For private, public and industrial car parks. 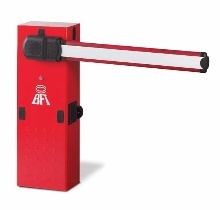 Electromechanical barrier 24V dc with adjustable speed and anti-crushing safety. 24V up to 220 NM Torque.